I am republishing this article because a critical reference no longer exists. I have replaced it with a new reference, highlighted below. I recently re-posted my arti­cle about Publishing Scams and How they Work. I won­der why so many authors, after spend­ing thou­sands of hours work­ing on a book, fail to con­duct a few crit­i­cal hours of research that will save them thou­sands of dol­lars and immense frus­tra­tion. Perhaps it’s because the sys­tem that preys on unin­formed authors is so pow­er­ful, enor­mous, and far-reaching that it sounds like a wacky con­spir­acy the­ory. It can’t be true. This sounds like Bermuda Triangle stuff. David Gaughran’s arti­cle, “Author Solutions and Friends: The Inside Story,” explores how doc­u­ments related to law­suits filed against Author Solutions sug­gest its rela­tion­ships with such pub­lish­ing lumi­nar­ies as Penguin/Random House, Publishers Weekly, Lulu.com, Kirkus Reviews, and oth­ers are part of a huge web of influ­ence and decep­tion that preys on authors. Emily Seuss does a capa­ble job of warn­ing authors on her own blog. Something that sounds like a con­spir­acy the­ory isn’t nec­es­sar­ily false. The very notion of a self–pub­lish­ing com­pany is an oxy­moron. As peo­ple of words, authors need not be led so far afield by games of cheap seman­tics. If you sent your clothes out to be cleaned, you wouldn’t claim to be doing your laun­dry yourself. If you went to school, you wouldn’t claim to be self–edu­cated. Why is it that peo­ple who hire an author ser­vices com­pany claim to be self–pub­lished? Beyond the art of writ­ing lies the busi­ness of pub­lish­ing. Just as you had to learn the basics of gram­mar, spelling, and style to become a writer, you must learn the basics of book pro­duc­tion, dis­tri­b­u­tion, and mar­ket­ing to become a pub­lisher. There’s no such thing as “hand off your man­u­script and be done with it”—even in tra­di­tional publishing—but this fan­tasy is the fly­pa­per that van­ity presses use to attract and kill their prey. Life is full of dan­ger. Crossing the street is poten­tially fatal, but with a lit­tle bit of knowl­edge, it becomes a triv­ial under­tak­ing with high odds of suc­cess. Publishing is no different. Research pub­lish­ing before you fin­ish your book. Don’t fin­ish the last page and ask, “what do I do now?” Buy books on self-publishing and read the many blogs on the topic. Work with pro­fes­sional edi­tors, type­set­ters, and designers—but con­tract these pro­fes­sion­als your­self. Why pay a pro­fes­sional rate for marked up ser­vices? Work directly with the peo­ple who will be work­ing with you. Steer clear of mid­dle­men. If you’re hav­ing design con­ver­sa­tions with an account rep­re­sen­ta­tive, you’re being kept out of your own loop. Own your assets. If you’re a self-publisher, buy your own ISBN num­ber. File your own copy­right appli­ca­tion. Don’t fall for the “free ISBN” scam; you get what you pay for. Pay the (ridicu­lous) fee for your own ISBN num­ber and estab­lish your­self as the pub­lisher of record. When you work with edi­tors, artists, and design­ers, the dig­i­tal files they pro­duce are works made for hire; they belong to you. Avoid any­one who refuses to share these assets; lever­age over you is the only value these files give a con­trac­tor once your book is in production. Run the num­bers. Understand how many books you have to sell before you make any profit. Calculate the costs of any ser­vices you con­tract, seller com­mis­sions, and your research and writ­ing time. Many writ­ers elect to spend more money than they’ll earn for the sim­ple joy of writ­ing and pub­lish­ing a well-crafted book. This is fine—as long as you don’t con­flate the goals of art with the goals of business. I’ve pub­lished six books of my own and helped many other authors pub­lish theirs. I’ve had to over­come a few pro­duc­tion chal­lenges but I’ve never been scammed or ripped off. I even got a per­sonal tele­phone response from top-level execs at Ingram when I had an impor­tant qual­ity con­trol prob­lem to bring to their atten­tion. My deal­ings in self-publishing have been over­whelm­ingly pos­i­tive. I’ve dealt with plenty of hon­est peo­ple who are gen­uinely con­cerned about pro­duc­ing excel­lent work. The net­work of “author ser­vices” com­pa­nies that preys on self-publishers is hardly invis­i­ble. The first page of results from a sim­ple web search for “pub­lish scams” or a perusal of Predators and Editors Reedsy will keep you engaged for hours. 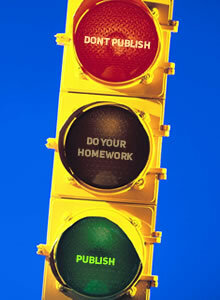 Spend an evening or two read­ing about pub­lish­ing to pro­tect all those hours spent writ­ing. Publishing scam­mers are greedy and uneth­i­cal, and the scope of their mis­deeds is shock­ing, but the only advan­tage they have over you is your own igno­rance. Publishing a book is as safe as cross­ing the street.